Every move that we complete requires meticulous attention to detail from our team, but the relocation and reorganization of a library is a type of move that requires additional care — especially when it conflicts with final exams for students. From the planning phase to the execution phase, our team led by project manager Daniel Fuchs, was able to assist with a two-phase library move last year. Our team was recently selected to move the University of North Carolina at Chapel Hill’s Kathrine R. Everett Law Library as it underwent and completed renovations. Even before any books were carefully packed away, the Hilldrup team helped to develop a plan that would allow for business to continue as usual for students studying for final exams. Together the construction contractor, library staff and Hilldrup team met regularly to determine working hours to minimize noise during peak study times, determine critical parts of the collection that students would need access to and ensure all necessary safety regulations and procedures were followed. “Our experience with Hilldrup was excellent from beginning to end. Brian Young was professional, knowledgeable, and very responsive to our many questions and concerns about moving and storing a valuable collection of thousands of books,” said Julie Kimbrough, deputy director of the Kathrine R. Everett Law Library. To keep the collection safe from damage, Hilldrup crews removed and packed all books for warehouse storage. Once the construction was complete, the books were then reshelved. While this might sound like a simple transition, it was extremely important to keep the 128,000 volumes organized while in storage so that they could be quickly unpacked and organized once construction was complete. As a part of this library move, our team also had to carefully move and store 12,000 boxes of microfilm. Additionally, certain volumes of books were removed from the collection, which required many shelves of books to be shifted and relocated once the move was complete. To keep things as organized as possible, the crew packed the books into storage with the reconfiguration in mind. 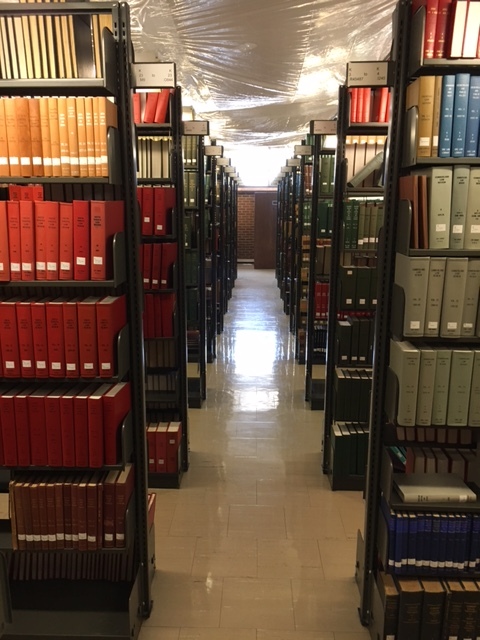 The two biggest challenges for the law library move were the precise schedule that needed to be followed and keeping the collection organized with the many changes that were being made. To stick to the precise timing and deadlines outlined by the contractor and library staff, the Hilldrup team and project manager Daniel Fuchs, were proactive about addressing potential pitfalls throughout the process. Good communication and asking the right questions kept everyone on the same page and on schedule. The Hilldrup team used a color-coding system to categorize and label the books as they were being packed. The library staff also helped the Hilldrup team develop a plan to keep the collection organized throughout the move. “One of the things that stood out for me is how much time Brian and the team leader for the moving crew took to carefully plan our project and set up procedures for organizing and packing our books before even a single book was moved. They worked closely with library staff members to ensure that the moving process was well-organized and efficient. The attention to detail at the beginning of the moving process was very reassuring and ultimately led to a very successful move,” said Kimbrough. In the end, the move was a success because of the care and attention to detail provided by the crew as well as the clear and constant communication between Hilldrup, library staff and the construction contractor.